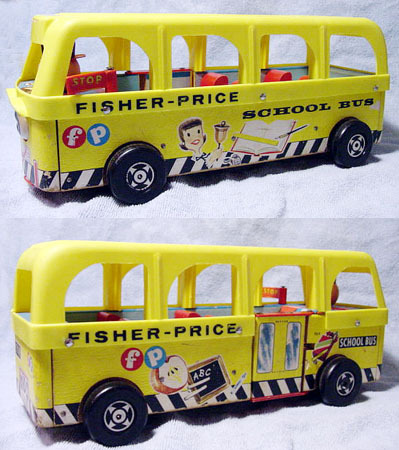 Description: The #984 Safety School Bus is the 2nd Original Little People bus made by Fisher-Price. It replaced 1959-Easter 1961's #983 Safety School Bus - The very first Little People set ever made by Fisher-Price. The #984 was a sequel, and like most sequels it paled in comparison to the first and best. The #984 has a yellow plastic top opposed to the #983's authentic-looking clear plastic top. Also, the #984 was not sold with a wooden roof top, where the #983 was. The litho-wrapped figures introduced with the #983 were modified as shaped all-wood bodies in 1960 for the #234 Nifty Station Wagon and #168 Snorky Fire Engine. The mom and dad sold in the #234 were sold in the #984 as a girl and boy. 3 other similar-shaped figures were created to complete the 5 Little People group sold with this bus. FPT556 - Yellow wooden school bus with a yellow plastic top. It has a wooden hinged door with a spring to close it, a wooden head driver who turns to look from side to side as the toy is pulled, and a red rectangular plastic stop sign by the door that can be turned in or out. The bus has a paper lithograph smiling face on the front with eyes that do not move. KKWW - Blue male with a thin depression circle around his base about 1/3 up, dot eyes, triangle mouth, dot nose, and black heat-stamped hair. *See Variations below. BFWW - Brown male with a bald head, dot eyes, a crooked smile, no nose, and a thin depression circle around his base about 1/3 up. KMWW - Green female with a depression to form waist and bust, closed eyes with eyelashes, dot nose, triangle mouth, and black heat-stamped hair with curles on the ends. *See Variations below. HAWW - Yellow mad female with a depression to form waist and bust, frowning, freckles, wearing a red beret. *See Variations below. GPWW - Red female with a depression to form waist and bust, 2 circles around the base below the waist, dot eyes, half-circle nose, triangle mouth, and a yellow disc hat. AAWW - The blue male could also have light brown heat-stamped hair opposed to black. KLWW - The blue male with light brown hair has also been seen without the circle around his waist. FRWW - The greem female has also been seen with red heat-stamped hair opposed to black. KNWW - The yellow female has also been seen with dot eyes, a half-circle nose, and a triangular mouth opposed to frowning and freckles.